It’s probably the least painful medical test you’ll ever do: just spit in a tube and mail it off for analysis! There are many genomic testing services popping up these days – but what can they tell you about which nutrients to focus on, or what foods to eat or avoid? I’m sharing the results from my Nutrigenomix test here to answer these questions, and maybe uncover some more (because if an answer doesn’t lead to another question, it’s not science!). The test itself is $350; many practitioners add $100-250 in counseling and personalized guidance fees. You can find a practitioner in most states and lots of other countries (see the end of this post for an offer from me! ), and collect a sample anytime, anywhere – no fasting required; just avoid eating for 30 minutes prior so there aren’t bits of what you just ate contaminating your specimen! Results take 2-3 weeks to be returned and come in the form of a pdf with explanations of each gene tested for and what that means. I’m sharing the overview charts from my own results here. Vitamins and minerals are absorbed in our small intestine to varying degrees – some compete for absorption against each other, some aid each other’s absorption, and some need to be converted into an activated state before our bodies can use them. The genes this test evaluates are mostly ones that make proteins that aid absorption or conversion into activated states…so if you’re a person (like me!) who has the copy of the gene that inefficiently converts beta-carotene (the plant version of Vitamin A) into the animal form of Vitamin A, you might need to focus on having more sources of the animal form (also called “pre-formed” – found in tuna, eggs, and goat cheese) or eating more beta-carotene sources (pumpkin, carrots, sweet potato) to up conversion rates. 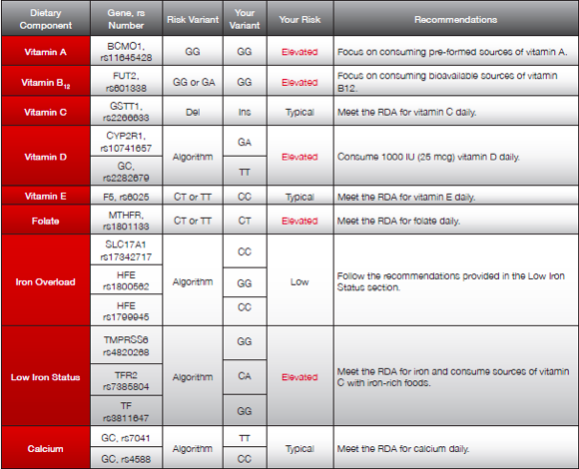 More complex is the conversion, storage, and transport of iron, so the Nutrigenomix test looks at a couple different genes to evaluate risk – I’m elevated in that category too! Many dietary factors have an impact on the cardiovascular system – caffeine can increase heart rate & blood pressure, fiber helps to regulate the amount and type of cholesterol, high blood sugar is damaging to arteries and veins – so by grouping several factors, you can get a clearer picture of what your individual risk might be. I was a little surprised that I didn’t have an elevated sensitivity to caffeine, since I’ve always felt it affected me more than other people (my gene variant that produces a protein to break down caffeine functions at the higher of two levels). Nutrigenomix notes that studies about heart health and caffeine are contradictory, with some finding an elevated risk of heart disease and and some finding a protective effect. It’s important to remember that caffeine is found in not just coffee, but also tea and other herbs, so there could be influence of other phytonutrients those things contain! When it comes to salt…well, this is one to take with a grain of it! My results indicate that my gene variant of the Angiotensin-Converting Enzyme (ACE) makes it more likely that my blood pressure will rise in response to sodium. However, this is a place where you have to consider lots of other factors…potassium decreases blood pressure, exercise reduces it, sleep & stress can influence it, and most people’s too-high sodium comes from processed foods. Also: blood pressure is easily and frequently clinically checked – mine is always on the low side; usually in the low 100’s over 60’s. My high intake of fruits & veggies (potasssium in all of them! ), regular and lifelong exercise, 8 hours of nightly rest, and freshly prepared meals all play a huge role in my good heart health. Additionally, there are many other genes that regulate blood pressure that this test doesn’t evaluate. So, like any other health number, this is just a piece of the puzzle…that I’m glad I know! Taken as a whole with the rest of the results in this category, overall I’m at low risk for heart problems, so at this point I am not worried about or controlling my sodium intake. A further point: a risk factor doesn’t mean you’ll have a problem – just that you need to control the environmental triggers of it. This is another area where taking the results as a whole is a good idea – several “FTO” genes are evaluated, and Nutrigenomix explains: “The FTO gene is also known as the ‘fat mass and obesity-associated gene’ since it can impact weight management and body composition. This gene’s role in the body is related to metabolic rate, energy expenditure and energy balance.” Variations of this gene can influence whether metabolic rate is average or lower than average, how much fat loss will result from exercise, and weight loss from eating a higher protein diet that’s lower in saturated fat. For people with the gene evaluated for physical activity variant is “enhanced,” exercise could help enhance weight loss– if physical activity is high. Food preferences and eating behaviors are also controlled by genes – more attuned taste perception of fat means some people may need less to feel satisfied, and sugar preference is partially controlled by a brain receptor called GLUT2, which is associated with either typical or elevated consumption of sugar. It’s very, very important to note that food preference is also strongly affected by your food environment and exposure to foods – just because you have a predisposition to like sugar or fat more strongly, or sense bitter notes in vegetables does not mean that you can’t learn to like a variety of foods! Many studies point to acceptance and liking of foods previously disliked, especially if offered frequently in childhood. The test only evaluates two food intolerances, but they’re big ones: lactose and gluten. Everyone (except for a very tiny percent of people) is born with the ability to break down lactose, since it’s found not just in cow’s milk, but also human breast milk. As we age, however, the lactase enzyme responsible for breaking down lactose can decrease in production and is controlled by genetic factors. My risk here is “elevated,” and I do notice some symptoms after having certain kinds of dairy (ice cream), or in large quantities. However, I don’t notice symptoms when consuming yogurt, most cheeses, or small quantities of milk (I do love a latte!). Some hard, aged cheeses have no lactose at all, so if you notice reactivity to those it could be a dairy allergy, not an intolerance. Non-celiac gluten sensitivity is a hot topic these days, and certainly our ability to break down this protein found in wheat products has genetic links. Nutrigenomix states that “The HLA genes produce a group of proteins called the human leukocyte antigen (HLA) complex, [and] research has shown that the HLA genes are the most important genetic predictor of gluten intolerance. Approximately 99% of people with celiac disease and 60% of those with non-celiac gluten sensitivity (NCGS) have the [high] risk version of HLA, compared to only 30% of the general population.” So to be clear, this test can’t tell you whether you have celiac’s disease, or NCGS – just whether the chances are higher that you might. I’m very much an advocate of having more information – more health numbers, context, and statistics…if there is a way they can be applied to improve quality of life. For me, this test gave me some interesting ideas and motivation, primarily around exercise, and having personalized results as a habit guide makes me feel more inclined to act. For some people, it might be information overload – it’s a lot to take in! – which is why I’m glad Nutrigenomix decided to only process testing through health professionals who could give perspective and guidance. None of these results provide a diagnosis for disease, and having a vitamin or mineral genetic risk factor does not indicate actual deficiency, just the potential of developing a problem if the right nutrient balance isn’t met. Maybe you’ve heard the expression “nature loads the gun, but we pull the trigger” – and for everything evaluated here, that’s absolutely true! Most people are not suffering from rare, unalterable genetic diseases, but millions suffer from chronic lifestyle diseases that could be avoided or improved with the right set of habits & patterns. As with nearly everything else in life: it all comes down to your choice to act. Interested in having your genes tested? Use the code V+B2017 to get $50 off your test and coaching package with me through the end of this year! Purchase here.